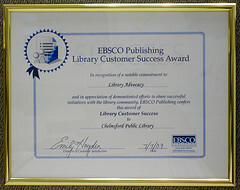 This is nice: the Chelmsford Library was recognized by EBSCO Publishing's Customer Success Center with the Library Customer Success Award for Library Advocacy. Since EBSCO serves so many libraries, they started noting instances where a library did something in a particularly outstanding way, and created a repository of these success stories. They interviewed me earlier in the year for a success story about the Library Use Value Calculator (read more). Last week we received the award from them (in the mystery box), and our case study was added to their Customer Success Center website (click "View Success Stories for Public Libraries" and Chelmsford's story [pdf] is the first one). I skimmed the summaries of some of the other case studies, and they are definitely worth reading. I had never heard of this before they contacted me, but now that I know about it, I'm going to see if I can translate successes from other libraries into improved service or practices at my own. And if you're doing something great at your library that you'd like to share, there is also a form to Submit Your Story. Please do, as well as add it to the Library Success: A Best Practices Wiki, because sharing good ideas between libraries makes us all better. Posted under Library, Random on Thursday, August 6th, 2009 at 3:19 pm, by Brian Herzog. Post and comments available via the RSS 2.0 feed. Both comments and pings are currently closed. Congratulations – this is awesome! It’s always nice to know that your hard work is appreciated and recognized. Congrats to you and your entire staff!